Autopilot technology is advantageous for boaters in many ways, including convenience, voyage efficiency, fuel savings, and safety. But what are autopilots, and how do they work? An autopilot is a combination of electric or electronic navigation tools that steer a vessel without continual hands-on involvement. 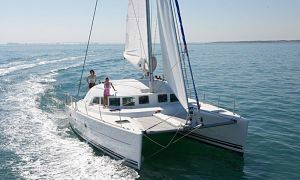 Autopilots allow short- or single-handed sailors and boaters to leave the helm to trim or rig sails, adjust lines, set anchor, eat without interruption, take short naps, or other activities while not at the helm. Autopilots have been used on commercial, sail, and power vessels for over a century, in various forms, making navigation safer and more convenient. Mariners have called autopilots by nicknames, like “Iron Mike,” “Otto,” or “the silent crew.” Autopilots for smaller vessels are generally priced below $1,000, with limited features. Below-deck units for larger boats that perform complex functions can cost upwards of $3,000. Autopilots work much like cruise control on a vehicle, except that manual control of the tiller or steering wheel is not needed: After the vessel is steadied on a desired heading for a few seconds, an “Auto” button is pushed and the autopilot takes over. The computer remembers the heading and adjusts rudder position to keep the vessel on the selected course, even in high winds, strong currents, or over/under steering situations. Autopilots generally consist of three main components: a course computer (also called a central processing unit) that contains a compass, a drive unit that applies force to move the rudder, and a control unit. 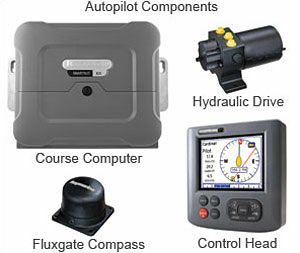 Autopilots come in a variety of arrangements, dictated by vessel length, displacement and steering type, including above-deck units and below-deck units, described below. An older type, a wind vane, transfers wind energy from a vertical air paddle to a trim tab or water paddle affixed to the rudder. Wind vanes have mostly disappeared, replaced by modern autopilots. Above-deck autopilots are common on smaller sailing and power vessels (generally 40 feet and under) with tillers or steering wheels. The equipment is easy to operate, inexpensive, uses simple electric connections, and is energy efficient. The variety of available small boat autopilots makes them affordable, even for the occasional boater. Most tiller autopilots use an electric ram mounted between the tiller and a gunwale fitting to control the rudder. The computer sends a signal to the ram to move the tiller, which adjusts the rudder to stay on course. Depending on configuration, some units connect directly to the top of the rudder. The other type of above-deck autopilot is used on boats with steering wheels. 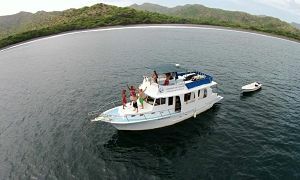 The autopilot connects directly to the boat’s wheel drive with a belt or toothed gears to move the wheel, powered by a small motor. Fluxgate Compass: Uses electronics to generate course headings and communicates with the rate gyro compass. Fluxgate compass data can be interfaced with chart plotters, GPS, and radar. Rate Gyro Compass: Indicates angular change relative to a course heading over short periods, not direction. Used to control pitch-and-roll movement, the rate gyro provides fast, accurate data and corrects fluxgate compass errors. The magnetic compass, which uses the earth’s magnetic pull to establish the north direction, serves as a reference for comparison to autopilot data. Linear: The most common type on sailboats which moves the rudder directly from the tiller arm or rudder using electricity. Rotary: Used on chain and cable steering (wheeled) systems that may use sprockets ranging from 13 to 25 teeth. Hydraulic: For boats with hydraulic steering systems. The drive unit must match the size of the existing hydraulic ram. Control Unit: The interface between the helmsman and autopilot, usually with an LED display on a control panel with knobs, joysticks, or buttons. Save fuel by reducing cruising time, particularly on vessels with a GPS interface. Have an infinite attention span and do not tire. Helpful when sail or power boating with a short- or single-handed crew. For anglers, pre-programmed trolling patterns can make fishing more productive. Many models are “self learning,” meaning they remember helm positions needed to hold a course and prevent over/under steering. An autopilot’s ability to hold a steady course without a helmsman has made them almost standard equipment on larger sail and powerboats. If autopilot components need repair, recalibration, or replacement during a voyage, getting service, especially in foreign ports, may be difficult. Heavy weather can affect how quickly an autopilot responds with helm corrections and works harder at maintaining headings in adverse conditions, which can strain the electrical system. Water intrusion and corrosion in the computer, drive motor components and wired connections can cause an autopilot to fail or generate faulty data. Even for short periods, an unattended helm without an engaged autopilot can put the boat off course and create potentially dangerous or unsafe situations. The electric power needed to operate an autopilot during rough weather and heavy use can be high and sudden energy spikes can cause the unit to fail or generate faulty data. In some conditions, navigating a vessel with an engaged autopilot can create potentially dangerous conditions. For example, if underway on waterways with heavy vessel traffic, known underwater hazards or shallow water or areas where crab pots are deployed are two situations when the helm should be manned. The autopilot should not be engaged while docking or maneuvering in close-quarters. Brief all crewmembers on how to engage/disengage the autopilot. Constant awareness 360 degrees around a vessel is critical, even with an engaged autopilot. Should an autopilot fail or generate suspect data, immediately disengage the unit, check the magnetic compass and adjust as needed. Most autopilot hardware is waterproof, but should be cleaned after a voyage. Below-deck units should be mounted in a dry, well-ventilated area, as they generate considerable heat. The speed at which an autopilot makes course corrections can be a safety issue. Speed is gauged by the amount of heading change (in degrees) per second as the helm is moved. The drive unit should have a dedicated breaker connected directly to the vessel’s main electric panel. To check autopilot heading accuracy, “swing the compass,” which is slowly turning the boat in a circle while the computer makes corrections. One-touch buttons that allow course locking and/or GPS waypoint tracking. Rudder angle indicators that show where the rudder is pointed; the units can also indicate how fast the rudder reacts to helm commands. Radar and chartplotters that detect close-aboard obstructions or vessels. If a threat exists, an alarm sounds and the boat is automatically steered to a safe heading. Remote controls that allow adjustments away from the helm, with ranges up to 40 feet. Small, LED screen “repeaters” that relay course headings from the computer and mounted in bunk areas or the galley. Sensors indicating when a vessel is about to surf. The computer senses when the boat is at the bottom of a wave and steers to the next set of waves. Programs that follow underwater depth contours, especially useful to anglers. Small transmitters worn by the crew. If a crewmember goes overboard, the computer steers the vessel into a stall so the man overboard can be retrieved. Installed and calibrated correctly and utilized as intended, autopilots of any size and type can enhance enjoyment, efficiency, and safety during a voyage.